Indexes ticked higher ahead of Friday's critical jobs report. 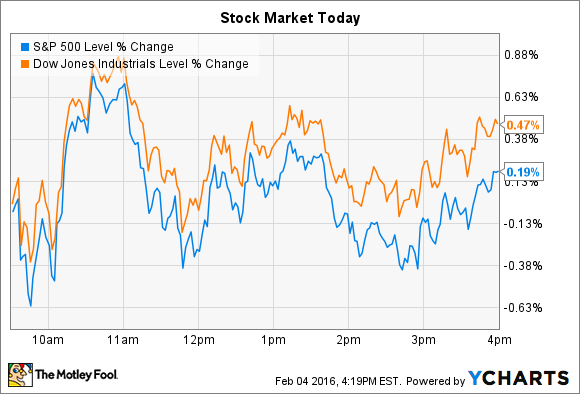 Stocks rose slightly ahead of a jobs report due to be released Friday. The Dow Jones Industrial Average (DJINDICES:^DJI) rose 80 points, or 0.5%, and the S&P 500 (SNPINDEX:^GSPC) tacked on three points, or 0.15%. Before the market opens on Friday, the government will release its employment report for the month of January. Economists expect to see 190,000 jobs added -- down from 292,000 in December -- as the unemployment rate holds at 5%. The data will be scrutinized by investors for signs that economic growth has slowed, which would likely push the Federal Reserve off of its projected course of multiple interest rate hikes this year. Meanwhile, a few individual stocks made notable moves today, including retailer Kohl's (NYSE:KSS) and action camera maker GoPro (NASDAQ:GPRO). Both companies' shares fell sharply in the wake of disappointing fourth quarter earnings results. A sales growth warning from Kohl's sent its shares plunging 19% to a new 52-week low, while taking most of the retailing sector down with it. The department store chain's fiscal fourth quarter sales were "very volatile and less than planned," CEO Kevin Mansell announced in a business update this morning. While shopper traffic was strong during the critical weeks around Christmas and Thanksgiving, management said, the early November and January time periods were much worse than expected -- in part because of unseasonably warm temperatures in much of the country. "Soft demand for cold-weather goods led to lower store traffic in these more discretionary shopping periods," Mansell explained. The good news is the company managed strong e-commerce growth as digital orders spiked 30%. However, weak customer traffic produced flat comparable-store sales, which was a slowdown from the prior quarter's 1% increase. Kohl's was forced to slash prices to achieve even that zero-growth result. In fact, management lowered its full-year profit outlook to $4.00 per share, down from about $4.50, due to "significantly lower than planned gross margin," according to the business update. Action camera maker GoPro saw its stock fall 9% after announcing a 31% plunge in fourth quarter sales, and a huge hit to profitability. Revenue for the quarter sunk to $437 million from $634 million, as the company badly misread demand for its Hero 4 product lineup over the holidays. GoPro recorded several charges in connection with high pricing and a rapid production pace, driving profit margin down from 48% of sales to 30%. Despite the painful fourth quarter, management found encouragement in GoPro's bigger picture trend. "In 2015, we recorded 16% year-over-year revenue growth and the fourth quarter represented the second highest revenue quarter in the company's history," CEO Nicholas Woodman said. But executives are aware that its hardware solutions currently suffer from major usability issues. "We recognize the need to develop software solutions that make it easier for our customers to offload, access, and edit their GoPro content," Woodman said. The year ahead isn't likely to produce any growth at all, though. GoPro's initial 2016 outlook targets sales of about $1.4 billion, down from $1.6 billion in 2015. Gross margin should continue its downward trend, reaching 36% at the midpoint of guidance compared to 42% last year and 45% in 2014.